Seahorses are truly unique and amazing creatures. Unlike most other fish, they are monogamous and mate for life. Rarer still, they are among the only animal species on Earth in which the male bears the unborn young. 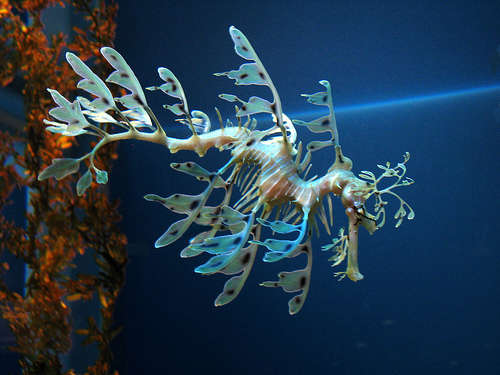 Seahorses are found in shallow tropical waters throughout the world. Seahorses swim upright and range in size from 0.6 to 14 inches long. Male seahorses have a brood pouch on their front-facing, side. During mating the female deposits her eggs into his pouch. The male fertilizes them internally. The male seahorse carries the eggs in his pouch until they hatch, then releases fully formed, miniature seahorses into the water.